We’ll show you how to enhance collaboration and meetings with demonstrations on the hour. 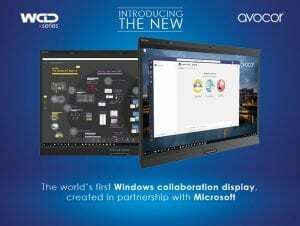 Avocor presents the world’s first Windows Collaboration Display, created in partnership with Microsoft. This all-in-one videoconferencing, whiteboard and touch display combines an integrated, high-quality camera, stereo speakers and an active, far-field microphone array to create a video collaboration environment. It is certified for Skype for Business and Microsoft Teams. Digicom is partnering with Dublin Chamber for the product launch and giving you the chance to experience this new amazing collaboration tool.